CM80 motors are temporarily out of stock pending resolution of some gearbox problems. The Robot Power CM80 is a powerful low-cost 24VDC brushed gearmotor with an integrated planetary gearbox. You may purchase the CM80 in our Web store. Gearbox Size: 56mm dia. x 50(15:1) or 37.5mm(4.25:1) long - 2.20" x 1.97"/1.45"
The CM80 is not a precision servo type motor and as such it has only moderate efficiency. When generating a full 1500W of output power the CM80 will consume approximately 2300W of input power. This is about 100A at 24V. Motor controls, batteries, and wiring must be sized accordingly. Batteries: - Since the CM80 is capable of drawing very high current it is recommeded that high output, low internal resistance batteries be used: some of these include Nicad, Nmih and Lead-Acid. Motor Controls: - The motor control chosen for the CM80 should be capable of sourcing 100A of current for significant time periods and be capable of withstanding peak current surges of 200A or more. The Robot Power OSMC is an ideal match for the CM80. Smaller current-limiting controllers may be used with caution. Capacitors: - The CM80 does not come with pre-installed capacitors. During testing we found it to be very electrically quiet due to its sealed case and axial brush design. Capacitors may easily be installed within the brush cap for a clean installation. If capacitors are desired we recommend heavy interference suppressor type capacitors such as the Panasonic ECQU3A series. A capacitor value of .1µF to .22µF usually works well. Wiring: - 10GA (2.6mm) or larger copper wire should be used when connecting the CM80. 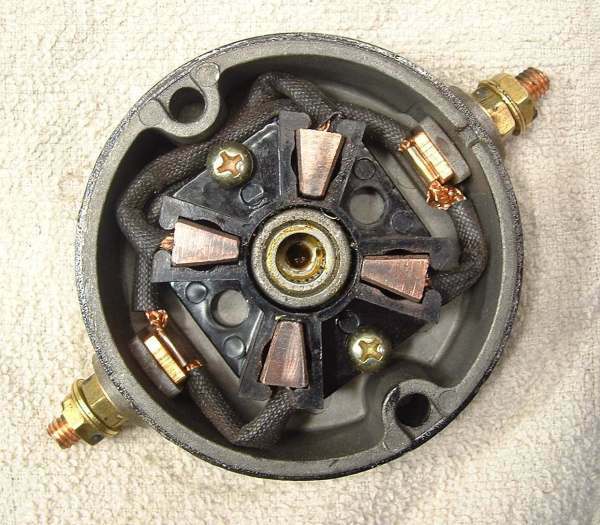 Heavy gauage ring terminals may be used or the power cables may be directly soldered to the motor terminals. See below for detailed photos of the construction of the CM80. The CM80 includes an integrated planetary gearbox with either a 15:1 or 4.25:1 ratio. A massive 9mm thick steel ring gear supports the steel planet gears riding on hardened 5mm steel pins. This isn't your father's cordless drill gearbox! The gearbox held together with three rather small M3 bolts. When mounting the CM80 it is recommended that both the gearbox and the motor can be supported. 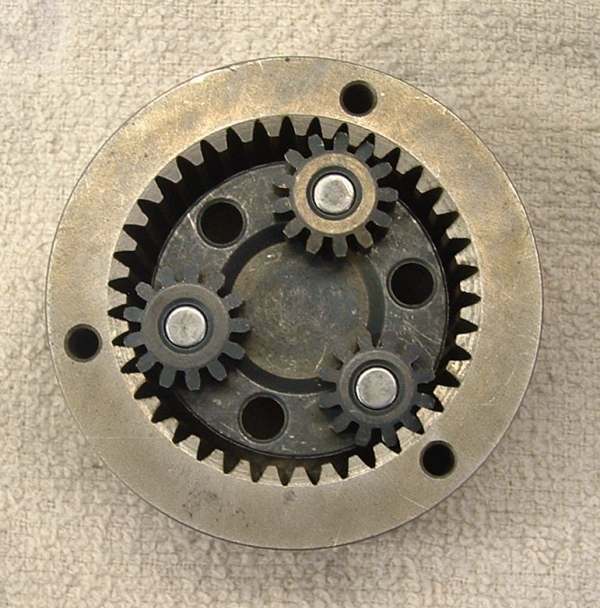 The M3 face mounting holes on the gearbox are NOT sufficient to support the motor and gearbox. 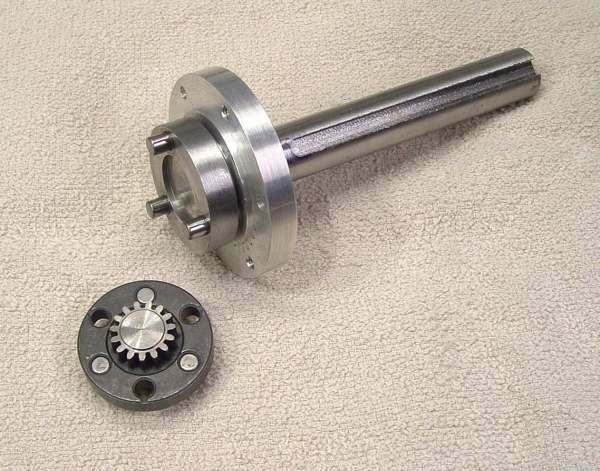 The planetary first stage carrier and the output shaft carrier are both machined from a single piece of high-quality steel into which the hardened planet gear pins are pressed. A 17mm ball bearing supports the output shaft. The 4" shaft length allows easy direct mounting of wheels and pulleys or sprockets with enough shaft left for an outboard bearing. The armature of the CM80 is of a axial design which minimizes sparking and armature wear. Little or no break-in is required to seat the brushes on the armature. The brushholder is cast Aluminum for efficient heat dissipation. 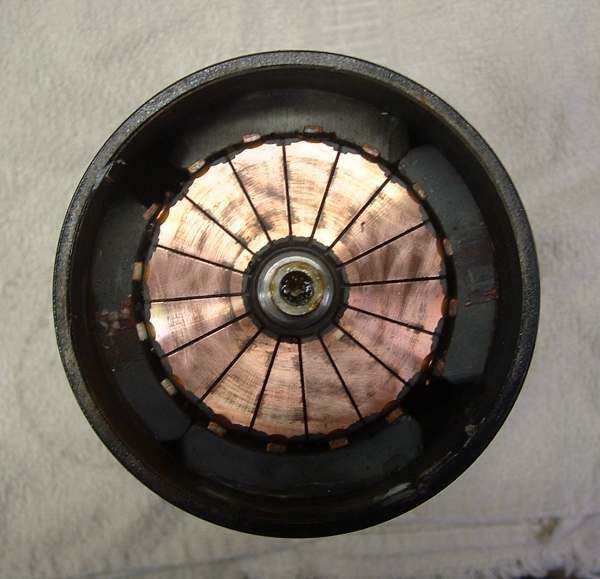 There are 4 brushes to share the current to this high-power motor. Roller bearings support the back end of the armature. Copper M6 bolts on the motor terminals allow easy connection to the power cables. The motor terminals may be rotated 90 degrees and re-located through the back side of the brush cap to reduce the	maximum radial dimension of the CM80 to the diameter of the motor can (requires drilling the brush cap). Motor "timing" is slightly adjustable by rotating the brush cap relative to the magnets. Robot Power offers the the CM80 fully assembled ready to install and use. Check the Web store for details on prices and special offers.